River Mandakini, its wrath much in news recently, originates from Chorabari Glacier near the high Himalayan hills of Kedarnath temple and flows down to merge with river Alaknanda at Rudraprayag. Most of its course, when not passing by any village, is surrounded by forests. Kakdagad is almost 40 Kms from Rudraprayag. "It's 5 PM, time for the Honeyguide." Construction of a bridge on the mouth of a narrow river (known as Akash Ganga, at best a small tributary stream now, with scanty rains and all) which debouches into river Mandakini, was creating a commotion. However, 100 m on we lost sight of the workers as we walked along the abundant boulders down below to our left with a tumbling stream swishing over. The rock beehives were now visible at the same level on the other side of the river, a steep hillside with a few intact and a few broken bee combs abandoned by the wild bees. Negi scanned the Akash Ganga valley with his binoculars, "Can't see the Honeyguide, let's wait for it." "When were you here last?" "Three days back; it's sure to come." "There it is," he whispers in muted excitement, his enthusiasm as fresh as someone on a lifer. We suddenly see a dark finch type bird with a clear yellow rump circle the area and fly back towards the cover of the jungle in front of us. "It will come back. It likes to wait in the nearby trees and then finally goes to the hive." An hour passes by, and we see no sign of the Honeyguide. Nor of any other bird, I think of the Cheer Pheasant, but on a local report, higher elevations of Madmaheshwar may hold them. No sign of Kalij either, which normally is barely happy far away from the din of humans. The Monal I knew I would find at Tunganath, and one hardly expects a Koklass in a low, shallow and disturbed forest. "It's getting dark now, and I am afraid, we might not get a shot." I sounded meditative if not altogether dispirited. "It's because of these noisy Ashy Drongos that our bird is not coming near. I can also see a Blue Whistling Thrush nest just two meters from the combs." He finds a reason. Stealthy Blue Whistling Thrush, not a raptor, yet a slayer of young birds, even, not sparing a large juvenile Long-billed Thrush. Once, however, on a quiet morning, after a stormy night, I saw it whistle by the Nainital Lake. It continued for a long time with its sweet and melodious whistle. Just then, our Honeyguide flew in and perched right next to the Drongos on the other side. A casual look would not have revealed the bird now resting quietly in the dark woods, the guise of the bird being much similar to the perch of its choice. The compact flash cards of the camera worked overtime to record clicks of the bird, which was nothing more than a speck. After a while, the Honeyguide rose and at the same time, by chance, a pair of quarrelling Ashy Drongos created a commotion which made the bird divert its flight to a tree just meters away from me. Now I could see the ruffled bird, in breezy surroundings and magnified proximity, much more clearly. The dark bird in the green umbrella of the trees, the creepers, the mossy sheaths on the tree trunks; magical moments held forever. The bird, playing hide-and-seek behind the swaying leaves, threw a lot of challenge to my camera. Shoot as you will and be overwhelmed as much, a better shot desire never lessens. 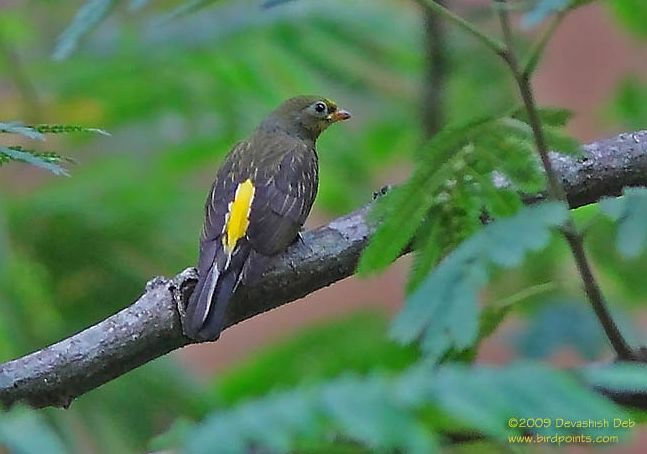 The impassive but alert Honeyguide, secure in the knowledge of available food, soon flew to a bee nest attached to the mossy reddish grey rocks and remained hidden from view. After ten minutes or so, it flew back to the jungle. While walking back in the falling darkness I sensed an unusually warm evening in the Himalayas.